This is a Friday afternoon post which, though it is relevant to discovery, is more about using observation and investigation to draw conclusions about photographs. Evidence does not always come in neat electronic packages or from the mouth of an unimpeachable witness. The picture of Prague at left is taken from the article which made me think about the subject, which I discuss below. In that case, the ambition was to try and work out roughly when it was taken. On that same theme, here is a picture of Piccadilly Circus and Shaftesbury Avenue in London, widely available via Google with the description “London 1930s”. 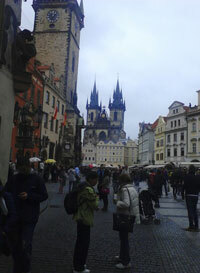 I will come back to it at the end, after looking at the Prague article. First, an eDiscovery reminder. One of my reiterated themes is the importance of what we can still, just, call “non-conventional” data sources, including non-text material, generated by smartphones and other devices. The main theme is the use of the plentiful information which can be derived from such data, from its container, from the device, or from any cloud-based system to which it is all uploaded. I wrote about it recently as a result of an article by Craig Ball called Mobile to the Mainstream. By chance, a news item about a conspiracy to murder case gave me a second chance to cover the importance of text messages. Photographs raise particular issues, not least because they often turn up without any supporting metadata or EXIF data (Exchangeable Image File Format, which includes a mass of data beyond the usual notions of metadata). There are sophisticated software tools which will find and extract data from photographs and cross-match it with other data. What, however, if you just have the bare photograph, perhaps a print? There is a double-crossover here between my work and my leisure activities. I am going through my own old pictures, many of them scanned from paper, negatives or slides. It is only recently that I acquired a camera capable of capturing location via GPS. It can be hard to identify a location even if you were there, especially if that was 35 years ago. My second relevant hobby is trying to place and date pictures which turn up on Twitter or elsewhere. One tweeter used to buy up slide collections at car boot sales and seek help in working out where the pictures were taken; another publishes old pictures of railway stations, not as a competition, but because they genuinely want to know where they were taken. Sometimes Google Images will find a match, but Google’s public tools for doing that are laughably defective (“Nearest match is ‘track” it says helpfully when you search for a station picture). One is forced back to deduction, innate knowledge and other research. I recently came across an article called Dali, Warhol, Boshirov: Determining the Time of an Alleged Photograph from Skripal Suspect Chepiga on the Bellingcat site. It concerns an attempt to date a photograph from Facebook. There was no issue in that case about the location, a well-known tourist landmark in Prague, but there was a reason for trying to determine its date. The dating, and indeed the timing, of photographs can be important. In England and Wales, we have had a shipping insurance claim (The Kairos) rejected by the court, thanks in large part to (late-delivered) metadata showing the timing of photographs;. In another case, photographs produced to show the condition of a pavement were found to have been taken several days before an alleged accident. In the US, a claim relating to the condition of a rented apartment was overturned when the photographs produced in evidence were shown not to have been taken on the date alleged. In each of these cases, it was the metadata from the photographs which provided the evidence. What, however, if there is no such evidence? Facebook removes EXIF and metadata from photographs, and if you download one, the public version of the date is the date of downloading. I will leave you to read for yourself the complicated methods, and the wide range of tools, used by Bellingcat. My purpose is much simpler. If you do not have the metadata, and cannot get it from your clients or on discovery / disclosure, then you may need to fall back to old-fashioned detective work, using information gleaned from the face of the photograph. In the Bellingcat case it was an advertisement for a particular exhibition dimly seen in the background. This sort of detective work can be quite fun. One day, it may be vital when you are looking to support or undermine photographic evidence. The London picture above provides another example. 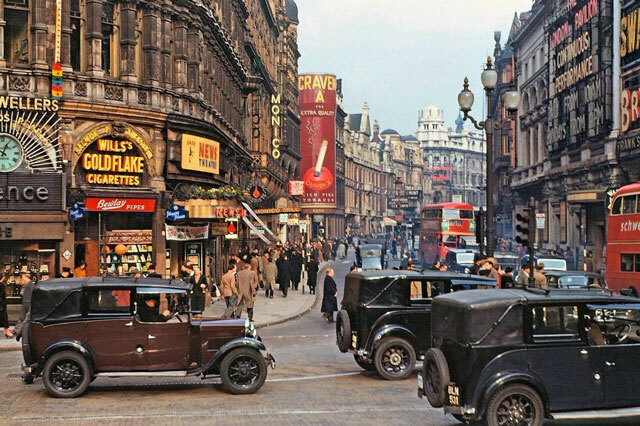 The usual caption “London 1930s” just feels wrong, if only because the cars look too modern (I am no expert on this – I just had the sense that they didn’t belong in the 1930s). A closer look (on a larger version than you see here) shows that the play “Treasure Hunt” is on at the Apollo Theatre. As with the Prague picture, it is not hard to discover that Treasure Hunt opened at the Apollo on 14 September 1949. I can’t find how long it ran for, but the picture looks autumnal (most people in coats, some not). We can reasonably date it to the last quarter of 1949. We don’t need more to destroy the “1930s” suggestion, but the bus coming down Shaftesbury Avenue looks to me (after a bit of delving) like an AEC Regent, newly in production when war broke out in 1939. Blackout regulations came into force on 1 September 1939 and I doubt that Piccadilly Circus was full of electronic signs even by day. As I say, this can be fun. It can also be vital if you really do need to date a picture. This entry was posted in Discovery, eDisclosure, eDiscovery, Electronic disclosure. Bookmark the permalink. Perhaps worth noting that although Facebook strips EXIF geolocation coordinates from photos on the wall, Facebook retains that data in the user’s account, and it can be retrieved by a user as part of a free, easy Facebook takeout. So, it remains an object to be discovered for geolocation information, even if the Facebook post is the last copy extant.